Over the following weeks, you'll learn the psychological habits of successful poker players. That's habits not inborn traits. Things you can learn and incorporate to change your poker success. Are you ready to choose excellence? I first became interested in poker several years ago, and like most beginning players, I started off reading books and playing whenever I got the chance. It wasn’t long before I figured out that poker is an immensely complex game that isn’t easily mastered. And yet, there are a small number of people who have mastered it and who consistently excel at its highest levels. I started to wonder about the exact ways in which the experts differed from lesser players. To find the answer, I conducted a research project for my doctoral dissertation where I interviewed a number of bona-fide poker millionaires. I discovered that there are actually a number of psychological traits that set them apart. This list includes a core of psychological skills and traits that top players use to help them succeed. The good news is that each and every one of you can cultivate these traits and improve your poker. I can’t guarantee you millionaire status, but I have no doubt that improving your psychological skills will pay immense dividends. Over the next few weeks, I’ll be sharing a series of articles that will show you how you can develop each of the skills in the core. In the meantime, here are some things for you to consider in your own quest for improvement. The first step in the journey to poker success is to make a conscious decision to choose excellence. Whether or not you improve as a player is solely determined by the decisions you make on a daily basis. You can choose to excel or not. You can choose when and if you study. You can choose to tilt or not. You can choose to react to challenges and obstacles either positively or negatively. You can push through obstacles and adversity or you can give up. You can choose to learn from each experience or you can let adversity stop your growth in its tracks. Whether or not you achieve your full poker potential is up to you and the decisions you make. Every poker session you play for the rest of your life will be filled with a mix of victories, challenges, setbacks, and lessons. Learning from each experience is a choice. At the end of the day, we are all capable of pursuing our poker goals. It won’t always be easy, but I’m hoping that my upcoming articles offer you a glimpse of what’s possible if you are willing to take a leap of faith and commit to the pursuit of excellence. 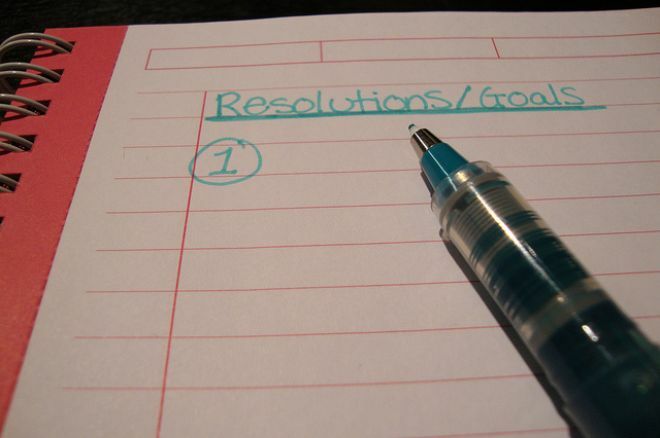 Photo: “Resolutions and Goals,” Ed Donahue. Creative Commons Attribution ShareAlike 2.0 Generic.